My dilemma is that I just posted my 12th Podcast!! I can't believe it has been a whole year since I began Podcasting. This is a wonderful episode too. It is the sequel to Karen Griska's first interview in Episode 11. She also has a surprise on the podcast too. You can listen to it here or grab it from iTunes! I am celebrating my 12th podcast and would like to share my good fortune with all my listeners of my Podcast and readers of my blog. You ask how??? Well I am going to do a giveaway!! Two lucky winners will win 12 fat quarters of their choice from the fabric that is in my shop!! How cool is that?? So all you have to do is leave a comment on this post, give me any suggestions that you might have for future podcasts and also future blog posts, if you like. Also, if you are already a listener or reader, tell me what you like best about my podcasts or blog. There must be a way for me to get in touch with you! Please leave an e-mail if you don't have a blog or other way to be contacted. It is open to everyone! I will leave this contest open until the end of April. I know that is a long time, but I would love for all of you to have the opportunity to listen to an episode or 2. So on May 1 me and Mr. Random Number generator will draw 2 winners. Please feel free to blog about this giveaway too! The more the merrier! Most of all thank you to all who listen to me and read my blog regularly! I truly appreciate you and the inspiration that you give! Don't forget today is the last day of the 20% off sale in my shop! Use the code more20 at checkout! I've really enjoyed looking through your gallery of quilting work done. Congratulations! I wished you lived near me! I'd love a blog post or podcast on designing quilts... the pattern, fabrics, etc. I keep my leftover binding, too! I'm so glad to find I'm not the only one. What have you used the leftovers for, though? I have ahuge bag full, and have no clue what to do with them! Congratulations Jackie. What a wonderful milestone!!! Ilove your blog and can't wait to find your podcast!!! congrats on the year mark. I love your blog with your sense of humor! And, you express yourself with color! My favorite means of design. I love your blog...not sure what a 'podcast' is though, will have to check it out! 12 podcasts! Congrats. It might be fun to have a post/mention on upcoming shows. Not the big ones that everyone hears about, but the local guild-sponsored quilt shows. I love those shows and seem to find out about them after-the-fact. Congratulations! Would love to see a podcast on binding a quilt. I am a beginner. I have listened to all of your podcasts and really appreciate the effort you put in for your listeners. I especially liked the enhanced version that you did in #11 because I could stop periodically and look at the pictures so my only idea is to keep doing enhanced podcasts! I haven't checked out your podcasts. Are they audio or video podcasts? I have time to listen to an audio podcast while I drive but can't watch a video during that time. However, quilts are visual, so video is very good in that respect. Hi Jackie, I like your blog and also your quilts, there is always something new for me :-) Greetings from Slovakia! 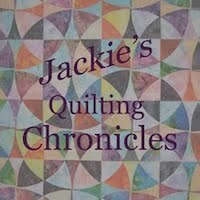 Congratulations, Jackie!I would suggest interviews with fabric designers and other quilting "stars". I love to see the quilts you're working on as well. Eye candy is always good. I keep my leftover binding and join the strips together to bind charity quilts-gives them an extra sparkle! Congrats Jackie on a year of podcasting! Very pretty bindings and a good bind to be in. Congratulations on some great podcasts and a super blog. I have really enjoyed it. You have a great eye for using color. That would make a good podcast I think. Congratulations Jackie on a year of podcasts and a wonderful blog. I would so love to help you out of this bing ;0) and take those fat quarters off your hands. It's my duty. I follow your blog... Such great goodies to read about... and great information.. I would love to hear about color...anything about color...how to use it, how to match it...etc..
How about new trends in quilting..
Congrats on a year! I love your blog! Crumbs! 12 podcasts! Many congratualtions on a year of theis successful venture. Interviews are always interesting I think. I keep my leftover binding also. I've used it on doll quilts, bags,etc. Congratulations on 1 year! Best wishes on this milestone! I would like to hear more about color choices and fabric choices.....how does value affect the choices? I'd love some tips on designing your own quilts. I'm terrible with that kind of stuff but would love to do it! Thanks! Congrats! I just recently found your blog through my Google reader and really enjoy reading it! I would love to see a post or podcast on pattern design, I'm graph paper and coloured pencils kind of girl, I wonder what other people do? Thanks for the giveaway! Atta Girl! on your 12th post victory! There's so many things to talk about...even write about in your blog. I'd love to see more photos with quilts and different ways to display them. You've got us all on the roll of making them...we need different ways to use them now.LOL. A podcast on how you go about developing a new design. On paper, on computer or just sit and sew and throw it on the design wall? And how to select fabric. Using a collection is easy but what to think about when you're off the grid so to speak. Thanks for the opportunity to win FQ! WOW! Yeah ME! Congrats about the milestone!! YEAH YOU!~! I Would like to see & hear some info on panographs & home mid arm quilting, any tips suggestions, thread types, needles, what works & what DOESN"T. ( I feel it is important to learn from other people's mistakes) etc.... Thanks!~! I really enjoy your blog - I like to see your completed projects and w.i.p's too - it's inspirational for me to see! I have a whole lot of w.i.p. and very little time to complete them... but I keep starting new projects! So, I like to see what others are doing and get ideas for little changes to the patterns i'm already working on. Thanks! I love coming to your blog...as far as podcast go...please don't stone me, I don't know what podcasting is.....am I bad or what? I don't know if I would change a thing....your blog is very inviting and informative...so keep it coming. I love your blog and have been following you for awhile! Your work is beautiful and so is your fabric! I am excited about this giveaway! Hope I win! I have never listened to your podcasts. I'll have to check them out. I would love some instruction on designing a quilt block and then putting that inspiration into a whole quilt top. Thanks for the chance! you are being more than generous! Thanks for the giveaway! I'm looking forward to this new podcast. I'd love to hear your tips on fabric choice--how to mix and match fabrics from different lines successfully. Thanks! I love to see photos. They help me see what it should look like and how I should do the project. I'm so happy to hear about another quilting podcast -- I'm downloading your latest episode right now and will certainly subscribe! One thing I like to hear in podcasts is reviews of things. Books are the most obvious. And I want them to be honest reviews -- a 100% positive review is not all that useful. Also, just talking about what's new in the quilting world (so-and-so has a new line of fabrics, I just found this great new quilt pattern, etc...) would be great. What a lovely collection of bindings you have there! I thought maybe you were going to give those away! Congrats on reaching this milestone. I haven't listened to your podcasts but will be checking them out now that I know about them. If you haven't already done this one, how about one on needles and threads. I'm always wondering if there is something better out there than what I am currently using. I love to come over and drool on the keyboard as I look at your beautiful quilts. I'm a way beginner quilter and wish I knew how to square the quilts better. Mine always seem to be a bit skewampus(is that a word?) Anyway I enjoy reading your blog and one day I should listen to a podcast. Maybe it would give me pointers. Congratulations on your 12th podcast. To be honest, I've never listened to one, but I think it's wonderful that you provide this form of communications for those that listen to them. I'll have to try them out when I have a few quiet moments. I have a couple of ideas for your leftover bindings if you want to send them my way, LOL!!!!!!!! My only suggestion is to keep up the goodwork! I love the podcasts because quilting is usually so visual, but it's great to have interesting content to just listen to while my hands and eyes are busy with other tasks. Love to read your blog! How about an interview with a fabric designer for you blog or podcast? Thanks for the giveaway! Thank you ever so much for this giveaway. And by the way that binding looks scrumptious. I keep my leftover binding pieces too :-). They are great for small projects. Re: future podcasts, I would love to hear interviews with fabric and/or pattern designers as to how they come up with their ideas and patterns and also how they got started in their quilting career. I think we all have dreams of how we can make quilting our full time job LOL. I love your blog! I think storage of stash and finished quilts would be a good topic. Also if you do fabric prep on brights that may run and what you do ...for colours like Reds. Washing and maintaining quilts quilts could also be thrown in there. I really enjoy the variety you bring to your blog. I know I'll find something informative and inspiring every time. I love the pretty colors in your bindings. I'm sure the quilts they went on were lovely! I never pass up a chance to get more fat quarters! Congratulations Jackie! I love how you share tools you use for your projects--like rulers--on your blog. No suggestions for the future except to say keep up the great work. I too keep my extra binding. I keep them in the bin of strips. cause they could be ironed flat for quilty bits or used to make a patchwork binding or small projects ect. stuff you have done in the past that I have found immensely useful have been the pod casts on batting and threads. they tend to be afterthoughts to alot of people, me included for along time, mostly cause I didn't known the technical information about them. I am a better quilter from having learned that knowledge. So happy for you Jackie. I love your blog. The way you use bold beautiful fabrics is inspiring. I love seeing what you are working on. It's very inspirational to see someone's work who has an eye for color and pattern and you definitely have that. Congratulations on your podcasts! I love your blog and all your beautiful creations! Congratulations on a year of podcasts! They are great when I'm on the treadmill at the gym! How about nitty gritty about quilt market for a podcast in the future? Thanks for the giveaway! Twelve podcasts are something to be proud of! How about blogging about what you are going to do with the leftover bindings!? I save my end pieces of binding, but I only have small pieces - maybe 3" to 10". Congrats on your 12th podcast and one year doing them Jackie. I've never listened to them before, but you did an outstanding job on number 12. Would love to see a video of you and your guest. Love reading your blog too. Thanks for the great giveaway. Congrats! I enjoy reading your blog and just seeing what other quilters are doing, especially with more traditional quilting. If I suggested anything it would be to add in little tips or definitions for newbies. Nothing super intricate, just simple stuff that you've found helpful. I also save my bindings...I use my left-overs to make a fun, colorful binding on my "for-fun" quilts. 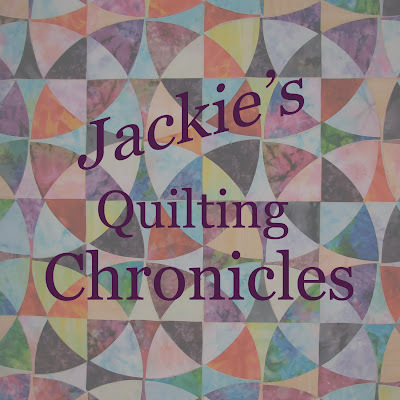 I've been 'follow'ing your blog for a while now - Today I listened to my very first podcast - your interview with Karen G.
I learned abut Karen's selvage edge from a quilter in Kansas 'Q is for Quilting'. Your podcast allowed me to listen to your conversation with her - thanks. BTW, I use my left over binding to bind my placemats. Piecing the shorter lengths allows for design elements not otherwise used. Thanks for adding to my creative world. Wow congratulations! I love to see your designs on your blog. I love the variety of your quilting topics. Leftover bindings are great for a scrappy binding, or use them as your own jelly rolls if they aren't bias. Love your posts; they always make me smile since they are full of colorful pictures. I follow your blog, and get your shop newsletter - love looking at your quilts and projects - so inspiring, and I'm always droolng over your fabrics. I enjoy reading articles about the design process for a quilt - right from the piecing through the quilting - and not "quilt as you like"! Congrats on the 12th podcast! I didn't know you had a podcast so now I know what I'll be listening to this afternoon! Congratulations on your 12th podcast! Your quilts are beautiful. Thanks for sharing your quilt journey with us in your podcasts. I love seeing all of the different colors and fabrics you incorporate into your quilts. I'm so timid about making bold moves, and it's quite inspiring to see someone so good at color combos. Congratulations on 12 podcasts! I'm going to have to go listen to them now because I don't know what you've talked about or not. I can't think of anything that would lend itself particularly well to a podcast about quilting. Some of the ideas in the earlier comments were good. I like the ones about aspects of design - that's one area that I have trouble. I bind by adding a border and folding it to the back of the quilt. I had a way to do it right and lost it, would love to learn better and the different ways to bind quilts. Congrats on a year of podcasts, Jackie! I love seeing what you're working on, and your long-arm work--I'm always interested in seeing more! Thanks for hosting such a great give-away! Would you believe I've never watched a podcast? I think I'll try tonight after the kids are in bed, if my internet isn't too slow. I love your blog and seeing lots of pictures. That's what really inspires me, so keep it up! Love your blog! I especially love all the pictures; it would be nice to see some tutorials. Keep it up! Kat. Congratulations on your podcast dozen! I'm interested to hear about free-motion quilting, as I have an ever-grwoing pile of tops and need a faster way to quilt them! That bias binding makes me droooool. Thanks for the chance at your giveaway! wow, you are so generous!!! 12 fat quarters is a dream come true! I love your shop, I browsed around a bunch and we have the same taste :) Thanks for the chance. Jackie, I've been meaning to send you a note about this - now I get to do it and be entered in your giveaway! Any words in your blogs which are links to other places in cyberspace don't show up on the coloured background on any computer I use. I don't know if I need to do something different but this doesn't happen on any other blogs I look at. For instance you say "My dilemma is that I just posted my !!" That is what it looks like to me and if I click in the space I am not redirected anywhere. On occasion your writing runs over to white space on the right side of the page - in those instances the links do show and I can use them to get where they are. So any suggestions? Is there something I need to do differently or something you can change to rectify this! Can't do podcasts, but I read your blog. I'd like to see a quilt along maybe using special rulers or templates like that winding ways you have pictured above. I'm not confident to tackle this myself, but with a group and maybe a special on the ruler/template it would be fun to do together? Tried my hand at freehand quilting and decided I should invest in a few basic stencils, so I'd like tips on how to mark a quilt with stencils in preparing to quilt with my domestic machine....videos would be nice. Congratulations Jackie. Hmm suggestions, I'm with Nancy, color anything to do with color, combination's etc. I'd also love to hear about different uses that are not just for quilts for the fabrics you stock. Congradulations! You must be one popluar lady!! Thanks for the giveaway! For some reason I can't access your pod casts, so if my suggestion has already been done- I'm sorry. But I'd be interested in information on using pre-cut fabrics. Thanks and congratulations. Congratulations! Thanks for the chance to win. I keep leftover bindings too and when I make scrappy tops I connect them all and make scrappy bindings...they're fun and look awesome on a quilt! Congratulations Jackie, what a great giveaway! The leftover bindings are so pretty and colourful- I imagine that the quilts were gorgeous, I recently read a tip, that was to sew leftover binding on to previous leftovers and keep a continuous strip to use for binding scrap quilts, which I think is a neat idea. Keeping my fingers crossed for the draw. Bye for now. Thank you for the chance to win. I would really love to learn to work with inset seams and curves,. I must admit to never having listened to any podcasts! I've got the attention span of a gnat, so without images, it's tough for me to stay focussed, but I will go and have a try! Promise! 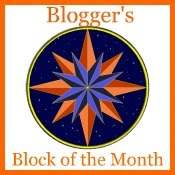 I'm very happy to have found your blog and find your posts very positive and energetic with great quilts, too! Thanks for this fantastic giveaway (and by the way, if you want something to do with all those bindings, cut off your jeans and bind the bottoms for cool summer capris!). I read your blog often. I enjoy looking at your Yummy fabrics most of all. After, I finish a few more UFOs I am placing an order. A little reward! I have 3 more... before I am allowed to reward myself. Don't sell them all on me okay? Thanks for this great giveaway! I definitely need to look up your podcast! Fun giveaway! I will add your podcast to my list! Congratulations on your milestone! I love visiting your blog as it is always fun & interesting...and you share your generous creative self! Congratulations Jackie! Great blog .. great giveaway ... I am now going to have to check out your podcasts! I always appreciate lessons on how to pick colors. I find that one of the hardest things. I always seem to have too much matching colors and not enough contrast. Great giveaway! I will have to listen to some of your podcasts now! I read your blog everyday, but haven't seen a podcast. I would like to see more of the quilts that you have quilted! What a great milestone! I must have missed the podcasts.....I didn't even know they were out there. I'll have to go and listen to those! Here's hoping that #104 is the lucky number! I really appreciate your sharing your trials and successes with your current projects -- you always have something helpful to pass along to us. Wow! What a generous giveaway! Thanks for the opportunity. I've been loving your blog ever since I discovered it. Recently I have been enjoying your African fabric posts. Thanks for sharing all of your knowledge and talents with us! Oh, I love your blog! I haven't listened to any podcasts, but I'll ask my hubby to do it for me tonight! I love that you love 30s repro fabrics as much as I do! I love that you share your difficulties as well as your successes! All around it's just awesome! Thanks for the chance to win and may congratulations to you!! I've just started listening to your podcasts while I work in my studio. You have a very pleasing voice for a background, but still keeps my attention. You did such a good job with that first set of interviews that you should do more. Not just with pros - like designers or teachers, but also with bloggers. There are a whole bunch of familiar names in blogland that would be good interviews, I bet. Congrats! I would like a podcast on paper pieced quilts like NY Beauty and then how to choose a good quilting motif for that pieced block. 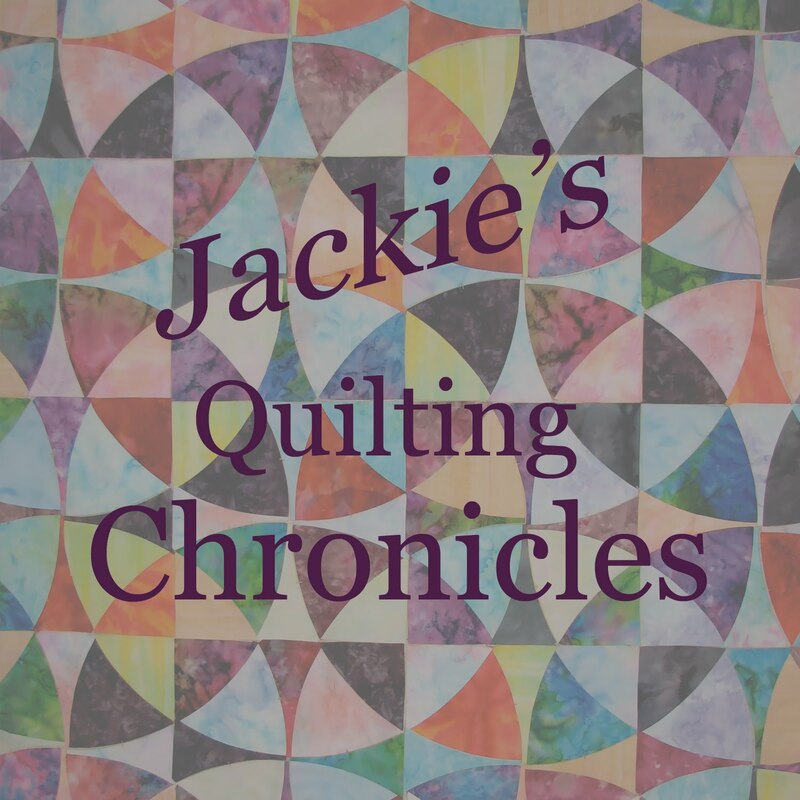 Just finding your blog via Jaybird Quilts - podcasts on quilting!? awesome - can't wait to check them out. Great giveaway too. Thanks! Just found you via Quilt Dad. I will comment now and definitely check out your podcasts! Thanks. I have been listening to your podcast from mthe beginning & really enjoy it. One thing i thought would be intresting would be for a round table type group podcast where one podcaster interviews another podcaster. Off to listen now.. congratulations...you know I love to listen and have learned so much from you and your guests! Keep up the great stuff!!! Wow! Congrats on the podcasts Jackie! What a generous giveaway! And gosh -- how does one put a finger on all the things about your blog -- it's YOU and that's what I love about it! congrats on #12! as for podcasts, anything about the design process is great. Wow, congratulations! Just found your blog via Quilt Dad...so I've never checked out your podcast. But I will! I'm thrilled to find a quilting podcast! Your quilting is very inspiring. Thank you for sharing! Thank you also for this generous give a way. Congratulations on an even dozen! Never had time to listen to any, yet! I appreciate the work you put into the podcasts--you can really tell you work hard at them. Congrats! I'm always interested in tips for quilting on a standard sewing machine. I can't afford a bigger one and don't want to hand quilt! I really love your blog I can't think of anything I'd like to see since I'm new to quilting I'm enjoying everything I see. Love your blog and seeing the great photos. I visit it everyday I even have it bookmarked. Do you ever do anything with reproduction fabrics? I haven't yet listened to any podcasts but you have me intrigued now! If you haven't already done so, I would love to see more about marking quilts for quilting. What a generous giveaway, and congratulations for a year of podcasting! WELL, STORIES ARE ALWAYS NICE TO HEAR WHILE SITTING DOWN FOR SOME GOOD OLE SLOW HAND QUILTING ! !THANK YOU FOR THE OPPORTUNITY CONGRATS ! Congratulations,this is a great giweaway. I cant get into your podcasts even I tried....? I link in my blogg too :-) Have a great day. Wow, Jackie, great giveaway! I love your blog for all the great inspiration. Wonderful giveaway. Glad I found you. Off to go listen to the podcasts. Congrats and I am always up for some free fabric. Love your blog!! I would love to hear you do a podcast (or series) on color theory - indepth on designing with color. I know you touch on this - but what I love most about your quilts is your exquisite use of contrast - it just makes them so appealing. I also liked the idea someone else mentioned on a brief "what's coming in future podcasts." I'd like to mark my calendar~~! Thanks so much for the opportunity to learn from you AND of course for this most generous giveaway! I know it will be "colorful!" Congratulations on the 12th! I am off to subscribe to your podcasts. I would loe to see one about creating your own fabric designs. Hi Jackie, I have a hard time getting to all the blogs I want to read, but plan on listening to your podcasts. I'm sure there chalk full of fun informative goodies!! Yeahhh... I want to know how desingning works!!! I love reading your newsletter. I found your store and blog thru the shop hop. Thanks for your giveaway!!! Congratulations on your milestone. I just found you from QuiltDad and I'll be visiting again. Love to hear a podcast or 2(and see a blog or 2) about not being afraid of the A word(applique).getting people to sign up for Applique workshops(for my guild) is like pulling teeth(I suppose, since I'm not a dentist).Takes time yes, but it's like meditating or entering nervana. It's so relaxing and you can do it ANYWHERE! Congrats on your milestone! I just discovered your site and am so glad I did! Jackie Congratulation on a full year of broadcasting! What a fun reward is to pick your own prize! Thank you a lot for your generosity! I like seeing your latest projects on your blog and your new fabrics! Maybe it will be fun to know how you decide what fabric to get for your store. what a fun giveaway! I'm new to your blog and podcast and can't wait to catch up! Maybe you should have a podcast on things to do/make with leftover scraps/fabric. Thanks for the great giveaway! I will check out the podcasts. Thanks so much! I really love podcasts...surprisingly, I can listen to them at work, and just really enjoy them. I would like to hear a little about fabric selection, that is hard for me. That is such a nice giveaway!! Your shop is great, too. You have my dream job, by the way! I'm looking forward to listening to some podcasts! Oh Jackie, that is so wonderful. Congrats!! I finally have a computer where I can listen to them, so, I am going to start at one and listed to them all, maybe then I will come up with an idea, but I think you probably have covered so much already! Sorry, but I can't listen to podcast because it needs fast speed and lots of bandwidth, which I don't have...although our local library could be a possibility if I could get there and spend time listening. Bog idea: I'd love any type of quilting tutorial...a pattern tutorial or whatever. Congratulations! Your shop is great and I love the podcasts! I always like other people's top quilting tips - maybe a podcast with a collection of those. Other people always think of great short cuts and ways to do things which simplify! Maybe once Violet is at school I can listen to some podcasts. As for your blog, I love the color, your eye for color and fabrics, your Fassett fabric obsession (like my own), your frequency of posts. What to change? Not a thing! Yours is my #1 blog! I like that you share what you're working on, your stash, little bits of your life. And I think it's important, now that you're getting such a great online business started, that you keep this personal. I go to blogs not only to be inspired, but to have a friendly 'chat' with the person. And I've found a lot of ladies are going all commercial, and I have less desire to follow that. I care more about people than things (says the girl surrounded by lots of things and no people) :D lol!! Congratulations on your 12th podcast. I'm a follower and love reading your blog, interesting, inspiring and beautiful bright visuals. A podcast/blog on "How important is labeling a quilt" - non of mine are.Does each quilt have to have a title/name etc. Thank you for a wonderful giveaway. I love your bindings, the colors are so bright and cheerful, you must have some gorgeous quilts to go with them! I've been listening to your podcasts since the beginning, Jackie, and I think that once a month is not enough! As to suggestions for subjects, how about doing an interview or having a discussion with other podcast hostesses! Have a great weekend and thanks for counting me in. I love reading your blog and seeing all the wonderful things you are working on. Congrats on all of your lovely podcasts, Jackie! I'd love to see/hear your thoughts on deciding how to quilt a quilt or how you and your customers decide how to quilt a quilt (i.e., picking a quilting design). Looking forward to more! I would love to know how one decides what quilting will look best with designs. I always find that is my most difficult part. I had found your blog but funnily enough not your podcasts yet... I was going to wait and listen and then comment but knowing me.. the window gets closed and by the time I remember the giveaway is over! So commenting now and promise to find them and have a listen when the busy-ness dies down! Jackie love your podcast :) first time to your blog, it is great!! Love the pictures!! I enjoy interviews, hearing about quilters specialties,I also enjoy hearing about quilt shows and projects that my quilt guild could use. Again Congratulations and love the podcasts!! Hi Jackie, loved your latest podcasts. It soudned like you and Karen had loads of fun and it was great to hear about new Quilty happenings! Keep it up, and keep adding images when you can, it makes a big difference from out here! Thanks for the great giveaway! I haven't listened to your podcast yet, but will definitely check it out. I'm always looking for new ones! I just discovered that you have a podcast. I love listening to podcasts on my drive home from work. I especially love hearing about quilting experience and projects of other quilts. I also love hearing what quilters do for inspiration. Take care! Thank you for this gift of your podcast! Hi Jackie I have been subscribed to your feed for a while now and I love it. Love that batik quilt you've made it turned out great. I have not check out your podcast but am heading there now it sounds like I will love it. Thanks for the chance to win and congratulations. Congratulations on podcasting for 1 year! I really enjoy reading your blog and will definitely check out all the podcasts! Thanks for the giveaway! Congratulations. And great giveaway!! For the podcasts, I would like a mini course on color theory and how color choices affect the mood of a quilt and would like to know if they have an influence on how you quilt. Fabuloso El regalo Que ofreces, no puedo "Escuchar Tus podcasts Por Mi Equipo, me encanta blog el, la Frecuencia de la publicacion de Las Telas y coloridas. I am excited to have stumbled upon your blog (and store!) As a beginning quilter I am inspired by your many beautiful creations (4th of July quilt, "Simply Fun" quilt). Your use of batik fabric is awesome. thank you and keep posting, please! What I like best about your blog is hearing about a long arm quilter's perspective. And I like your guests, I'm excited about the online quilt museum. Congratulations on your success. I love your bright colors. Will check out your podcast soon. Thanks for offering the nice giveaway. Congrats! I love looking at your lovely quilts for inspiration. And congrats!!! I'd like to see more tutorials or pics of your beautiful work. Something fun to blog about is your sewing room. Who doesn't like a peek into private spaces where talented people work? We especially enjoy (feel better!) knowing that everyone makes messes. That batik stars quilt is stunning! I love seeing the customer quilts that you work on and reading your blog. I will have to check out a podcast! Congratulations! I'm off to your podcast. Bye for now. How about a podcast on quilting on a budget and being environmentally friendly? e.g. using "found" fabrics, reusing, repurposing, thrifted, vintage clothing, etc. I am most inspired by pictures and info. on quilts done and being done, going to flicker groups to get a large sensory dose of color and composition throughout my days. I prefer to read rather than listen. Like another commenter, I love seeing how other people set up their sewing spaces and learning what inspires them. Perhaps an ongoing feature could be pictures of rooms and just everyday blog people info. I'm new here, but I'll be coming back... looks like a wealth of information for me to grab! I follow your blog but had no idea that you had a podcast. I will try to search it out through Itunes as I am in Mexico and don't get much information on quilting other than through blogs. Or many material choices so please do enter me in your giveaway!! Thanks for your sharing information with those of us who love to quilt. Congratulations for sticking with the podcasts. It's easy to start something, and something else to continue. I love seeing your older quilts so show us more. I am glad I am not the only one to save every usable scrap, even binding leftovers. I keep thinking one day I will need them for something, and I have been able to fall back on the scraps a few times when I need just a couple more pieces of a certain color. Congradualtions on your podcasts! Love that African Elephant. Your blog is always chock full of delightful ideas and virtual candy. Congrats on you podcasts!! Maybe do a scraps podcast....that would be neat! Your blog is fun and inspirational. Thanks for the chance to win! Just found your site today...LOVE your quilts! I listened to a podcast and hope to listen to the others soon. I love anything to do with quilts and quilting, and would love you to share insight - yours or someone else's - about dealing with all the "STUFF" we collect from stash to tools to books - and how to keep from letting it overwhelm! Your blog looks great. I look forward to listening to your podcasts. Congratulations on #12. I'd love to be one of your winners. You have some beautiful fabrics in your store. Thanks.